Go to original pattern for design DROPS 98-25. 1 reel colour no. 02, silver (for the edge). Drops crochet hook size 8 mm - or size needed to obtain the correct crochet tension. Accessories: 10 to 15 glass pearls approx. 6 mm in diameter. 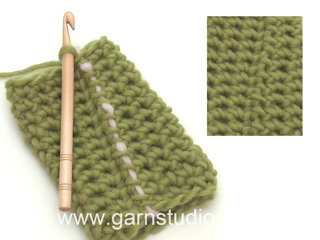 You can get the yarn to make this pattern from	7.30£. Read more. Crochet tension: 11 dc = 10 cm in the width. First dc in beg of round/row are replaced by 1 ch. Each round/row ends with 1 sl st in the ch in beg of round, (in ch in beg of prev row when working back and forth). 1st round: Crochet 3 ch and make a loop with a sl st in the first ch. 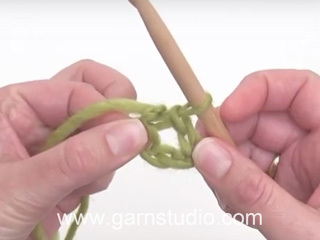 2nd round: Crochet 5-5-6 dc around the loop – read crochet info! 3rd round: 2 dc in each dc = 10-10-12 dc. 4th round: *1 dc in the first dc, 2 dc in the next dc*, repeat from *-* = 15-15-18 dc. 5th – 7th round: Crochet 1 dc in each dc. 8th round: *1 dc in the first dc, 1 dc in the second dc and 2 dc in the third dc*, repeat from *-* = 20-20-24 dc. Continue to crochet 1 dc into each dc until the piece measures approx 11-13-14 cm. 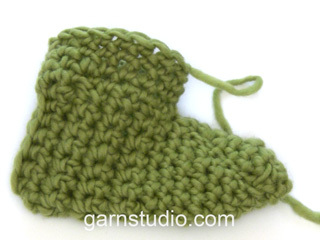 Heel: Now divide the piece and crochet back and forth from the centre top of the foot – remember crochet info – 1 dc into each dc. When the slipper measures approx 22-25-28 cm place it flat and crochet it tog at the centre back with a row of dc through both layers. Cut the thread and sew. Edge: Crochet 1 round of dc along the entire opening of the slipper with 1 thread of Eskimo and 3 threads of Glitter (If Glitter is not used, then just crochet with 1 thread of Eskimo). Finish the round with 1 sl st in the first dc. 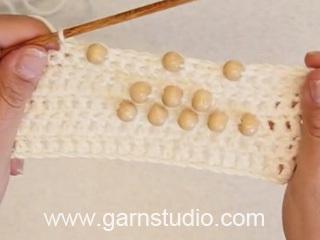 Crochet the next round as follows: *3 ch (if using pearls, these should be pulled on to the thread before this round. The pearls are pushed up on to the 2nd ch and will be placed at the centre of the point on the border edge), 1 tr in the 1st ch, skip approx. 2 cm, 1 dc in the next st*. Repeat from *-* and finish with 1 sl st in the 1st ch from beg of round. Bonjour Mme Dume, effectivement, cette partie "Cheville" ne concerne pas ce modèle et a été supprimée des explications. Bon crochet! No matter what hook size or yarn size I use I keep getting at tube shaped result, there are only two instances of increasing.. am I reading the instructions wrong? Dear Angela, slippers are worked from toe in the round to the instep (you should then get 20-24 sc - see size), divide then for opening of foot and continue back and forth to the total lenght of slippers - remember to check your tension: 11 sc = 10 cm (4") in width. Happy crocheting! What Does 5 5 6 Mean? Dear Mrs Britton, in first and 2nd size, work 5 sc around the loop, in the largest size, work 6 sc around the loop. Happy crocheting! Voor de zool hebt u gemeerderd zodat het werk vlak wordt en steeds groter. Als u nu een toer van vasten haakt, zonder te meerderen, dan gaat de rand vanzelf recht naar boven. Daarna haakt u het mooie schulpje, eventueel met kralen. Wat bedoelt u precies? De rand staat uitgebreid beschreven, dus geeft u alstublieft aan wat precies onduidelijk is. I can not figure out what it means when the slipper patterns ask to sc (5-5-6) is that amount of stitches for top and bottom, around how do I do this pattern? Dear Peggy, the pattern is given in 3 sizes, in the first 2 sizes, you will crochet 5 sc in the chain ring, in the largest size, you will crochet 6 sc in the chain ring. Happy crocheting! I am stuck on how to read this pattern and what it means on most of the crochet slipper patterns when it says sc (5-5-6) is that the number of stitches for top and bottom or around I don't understand help because I'm in love with the patterns. Wird bei diesem Modell von Anfang an nur in Runden gehäkelt oder wird immer wieder gewendet? Bei einem anderen Modell wird darauf hingewiesen, dass, wenn man in Runden häkelt, immer gewendet wird? Liebe Ilona, dieses Modell wird zunächst ganz normal in Runden gehäkelt und erst später in Hin-und Rück-R.
Bonjour, "A partir de ce moment, travailler en rangs (allers-retours)". Pour travailler le talon ou commencer justement, et doit on laisser des mailles sans les crocheter sur le pied? Bonjour Lena, dans ce modèle, vous commencez à crocheter en "rangs" à partir du début des tours précédents, au lieu de continuer sur l'endroit, en rond, comme avant, tournez et crochetez 1 ms dans chaque m jusqu'à la fin du tour = 1er rang, tournez de nouveau et continuer ainsi en allers et retours. Bon crochet!